You are here: Home / Adorable Coops! / 6 Country Chic Chicken Coops That’ll Also Deter Predators! It’s one thing to have a cute chicken coop…..and another to have a coop that’ll also keep out the predators. That being said, a coyote-safe coop can also be stylish! In this week’s Adorable Coops! 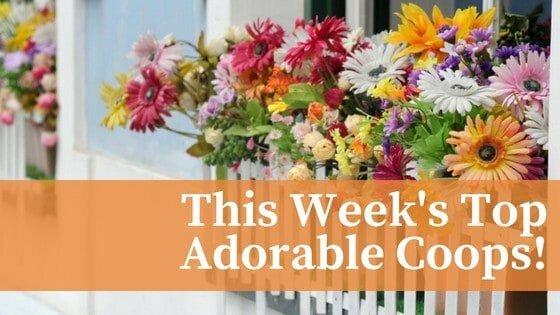 round up, we’ve scoured Instagram for Country Chic coops that are perfect for ANY backyard AND that are predator safe. You’ll see some common themes: bright colors, clean exteriors, and LOTS of hardware cloth! (Because we all know that when it comes to deterring predators, hardware cloth is where it’s at. So, here’s this week’s Adorable Coops – enjoy and BE INSPIRED! Thank you to my buddy Mike @goodingwoodworking for helping make my dreams of a Chicken Coop come true!!! It’s been a hot day but the landscaping gave it the finishing touch.